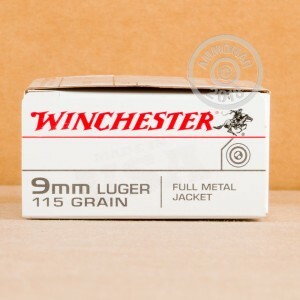 For a great time at the range practicing your handgun skills, grab this 500 round case of Winchester "white box" ammo in 9mm Luger. These cartridges use a standard pressure load ideal for all sizes of pistols including subcompacts like the M&P Shield, P938, and XDS. Each round fires a light 115 grain full metal jacket bullet at a relatively high muzzle velocity of 1,190 feet per second. 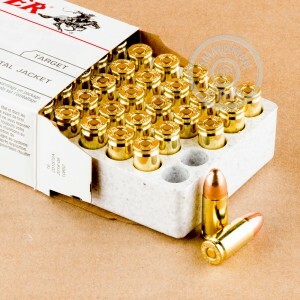 Like other Winchester ammo, these cartridges are loaded in Oxford, Mississippi using non-corrosive Boxer primers and brass cases. Tired of inflated shipping charges tacked on at checkout? Come to AmmoMan.com, where all orders over $99 ship at no additional charge! 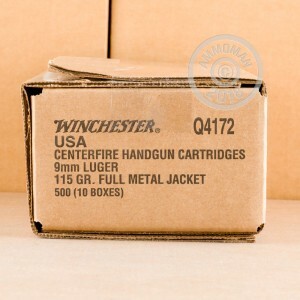 well packaged and decent ammo. Good ammo. Performs as needed. Absolutely what I needed! The pistol, a Bond Arms Bull Pup 9, is fussy. It requires ammo that is well crimped. This ammo does the job. Functioned flawlessly in my FN 509. Will buy more as needed. A really good target and range ammo.